It doesn't matter if he's been hanging out in a construction site, the DK Jungle, or even a high octane MarioKart circuit track—wherever Donkey Kong hangs out, he's a large and in charge character. If your child would like to step into the Nintendo universe, let him do it with this deluxe Donkey Kong costume. It might be every child's dream to hang out with Mario, Link, and all the other Nintendo universe big wigs, but when you choose this deluxe costume, your little one will be able to be a legitimate heavyweight in the video game world. And even though he might look more like a junior Kong in training, but we're sure he'll still be able to roll barrels or pilot that kart with the best of them! Including a plush velour jumpsuit, headpiece, and tie, this costume will let any child transform into this iconic video game character with ease. Soft sculpted chest pieces are attached to the jumpsuit to give your guy the look of a serious Nintendo character. 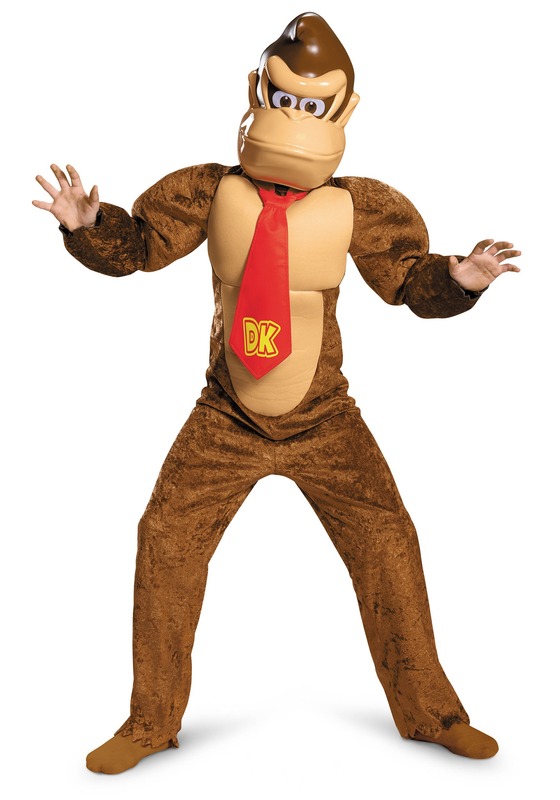 Attach the vacuum poly-formed front mask to complete your child's video game transformation, and when the signature DK logo tie is secured to his neck, well, he's going to be one dashing looking ape. Get your child this top flight Nintendo look, and we're sure your household will be bananas in no time! its creepy. the anthropromorphic proportions coupled with the bad build quality just crosses it.